One of the key jobs for ABA’s president and CEO is high-level engagement with the heads of regulatory agencies. 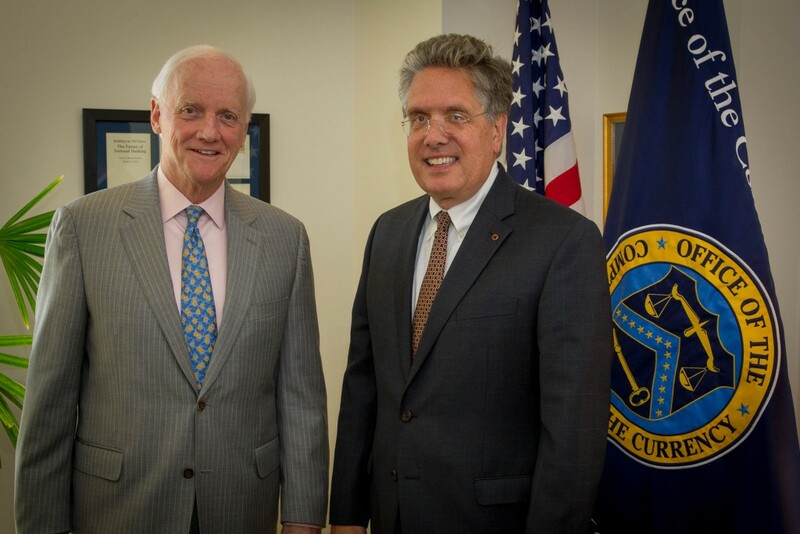 In this interview, Frank Keating discusses top banking issues—from regulatory relief and cybersecurity to de novos and the future of the mutual charter—with Comptroller of the Currency Thomas Curry. Q After five years of virtually no de novo activity, do you see that changing? Will the OCC play a more proactive role in encouraging the creation of de novos with strong business plans in areas that could use more banking options? A The OCC supports the creation of de novo banks with strong business plans, particularly community-focused banks and thrifts where bankers know the businesses and families they serve. More de novo activity would be a signal of strength for the economy and for communities. De novo activity is also about the future. How can new banks provide services to underserved areas and improve services in more established areas? The answer, in part, may be how bankers innovate and use technology responsibly to meet their customers’ needs and grow their businesses. Think about all the changes occurring in the banking marketplace today—mobile payment services, virtual currencies, peer-to-peer lending, crowdfunding, and online services where banking relationships exist only through a smartphone or home computer. While many of these changes have the potential to disrupt the banks’ role as intermediaries of credit, many of these services have the potential to keep banks a relevant and vibrant part of meeting the financial needs of tomorrow. Our task, as a regulator, is to make sure we have a rigorous process in place to understand and evaluate new approaches to permit and encourage responsible innovation for the benefit of consumers and businesses, while ensuring appropriate risk management and compliance with laws and regulations. Q With the release of the Federal Financial Institutions Examination Council’s new Cybersecurity Assessment Tool, how do you think cybersecurity practices at banks might change? Is the OCC planning to provide additional resources to help banks protect their customers? A The risk of cyber threats escalates each day as our financial system grows more interconnected and attackers exhibit increasing abilities to exploit vulnerabilities. Bankers, consumers, and regulators must face these attacks with ever-increasing awareness and vigilance. One of the most important changes that I have observed since becoming comptroller is that cybersecurity has become a topic for the boardroom. It’s not just a job for the technology team anymore. It’s a job for management, and more than that, it’s everyone’s responsibility. The FFIEC Cybersecurity Assessment Tool supports the industry by giving banks and thrifts a systematic way to assess their cybersecurity readiness and evaluate their progress. It goes beyond a compliance mentality, though. The assessment tool helps bankers and examiners truly understand the risks and the range of controls and practices necessary to manage cyber risk and to ensure banks and thrifts remain resilient in the face of cyber attacks. Q According to a recent ABA survey, 58 percent of banks with less than $500 million in assets have just one compliance officer—who has to deal with an unremitting flow of new rules, guidance, information and regulatory changes in a variety of different areas. What can the OCC do to help our smallest banks continue serving their communities without breaking the bank, so to speak, on compliance? A The OCC understands that community banks and thrifts have different business models, different risks, and more limited resources than larger banks. That’s why we tailor our supervisory strategies to each institution. That’s also why I have championed three ideas with Congress that I believe are responsible ways to reduce the burden on small banks and thrifts. 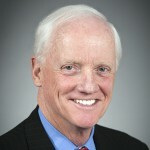 First, exempt community banks from the Volcker Rule; second, expand eligibility for the 18-month exam cycle; and third, provide thrifts with the option, subject to OCC supervisory oversight, to elect to engage in additional lending and investment activities that would help them better meet the evolving needs of their communities. While these efforts require congressional action, the OCC has flexibility under the law to reduce unnecessary burden. For example, the OCC, FDIC, and Board of Governors of the Federal Reserve System jointly drafted the final risk-based regulatory capital rule to reflect the nature and complexity of different institutions. Although some provisions apply broadly, many requirements, including the supplementary leverage ratio and the countercyclical capital buffer, apply only to the largest banks which engage in the most complex and high-risk activities. We also adjusted the final rule to address significant concerns raised by community bankers by retaining the capital treatment for residential mortgage exposures and allowing community banks to elect the treatment of certain accumulated other comprehensive income components. This AOCI treatment helps community banks avoid introducing substantial volatility into their regulatory capital calculations. Q Assuming you had authority to make the changes, in what other areas would you tailor regulation to help banks better serve their customers? Can you offer a preview of where the ongoing Economic Growth and Regulatory Paperwork Reduction Act review done thus far might lead? A Since the EGRPRA review process is still underway and the last public meeting to hear from industry and the public is in December, it’s too early to say what will come out of the process. As we go through the comments we’ve received, if we see a clear opportunity to eliminate unnecessary burden and we have authority to make the changes, the OCC will act, and we don’t necessarily have to wait to the very end to do so. The EGRPRA process is a meaningful one, but we should not stop there. We should look at other approaches to help community banks thrive in the modern financial world. One such approach involves collaboration, which is the subject of a paper we published last year. By pooling resources, smaller institutions can trim costs and serve customers that might otherwise lie beyond their reach. They can purchase materials or services jointly, share back office services, or develop products and services together. There are opportunities to save money by collaborating on accounting, clerical support, data processing, employee benefit planning, health insurance—and the list goes on. Q Your proposal to reform the Home Owners’ Loan Act to allow thrifts to elect the powers of national banks originated with your experience as commissioner of banking in Massachusetts. Can you tell us about this experience? What benefits would thrifts derive from this choice? A Federal thrifts need greater authority to respond to the changing needs of the communities they serve. They should be able to adapt their business strategies to current conditions without undergoing the costly and burdensome process of charter conversion. This approach worked in Massachusetts and it will work on a national scale. Giving federal thrifts more flexibility, subject to safety and soundness oversight, will help ensure they remain a vibrant part of our financial system. Q Four years after the Office of Thrift Supervision merged into the OCC, how do you think the OCC is doing at serving mutual institutions? Can you describe what you are doing to help these institutions thrive? A The mutual savings associations we supervise add diversity to the federal banking system, and they contribute greatly to their communities. We believe that mutuals need the ability to respond more easily to the demands of their customers and adapt more easily to changing market conditions. In Massachusetts, we permitted banks and thrifts to exercise comparable powers regardless of charter type. The Massachusetts statutory example was the model that became the thrift flexibility legislative proposal. The proposal, introduced in the House, would permit all federal savings associations supervised by the OCC to make an election to engage in the powers of a national bank while retaining their corporate form. This proposal is especially appealing for mutuals, because without this legislative change, a mutual would have to undergo a costly conversion to stock before converting its charter to have greater operating flexibility. If enacted, the statute would provide that the framework for the election process would be established by the OCC in a rule and any proposed election or exercise of powers would be subject to OCC supervisory oversight. The process would be more streamlined than the conversion process that mutuals, in particular, would have to go through to enjoy greater operating flexibility. The OCC has a Mutual Savings Association Advisory Committee that includes representatives from the industry. We meet two to three times a year to discuss issues facing mutuals and to consider regulatory changes or other steps the OCC may be able to take to ensure the continued health and viability of these institutions. We recognize just how unique the mutual model is. That’s why in 2014, we issued guidance highlighting the key distinctions between federal savings associations organized in the mutual form of ownership and shareholder-owned or stock institutions. The guidance describes the mutual governance structure and mutual members’ rights, outlines mutuals’ traditional operations, and highlights supervisory considerations in rating mutuals. Q For highly capitalized banks, the Basel III capital calculations often prove superfluous. Should a bank with capital levels already significantly above what Basel III would require be given relief from the complex calculations involved in Basel III? A One event that triggered this concern emerged out of the new standards for the treatment of high-volatility commercial real estate. Bankers have raised questions about whether loans should be classified as HVCRE or not. If a loan is classified as HVCRE, it is subject to a 150 percent risk weight instead of a 100 percent risk weight that applies to most other corporate loans. While we have heard some unease on this subject, the chief concern has been the ability to understand new capital standards. Basel III took effect earlier this year, and the OCC understands there will be bumps early in the implementation process. Before considering changes to the rules, we need to ensure banks have sufficient time to adjust. If we then do consider making changes, we have to be sure they both reduce burden and do not increase risk unnecessarily or encourage needless risk taking. We also have heard concerns about the length of the instructions in the Call Report related to the new standards. We understand that there will be an adjustment period, but one of the reasons for elaborating in the Call Report is to provide banks with further understanding to assist their implementation of the new rules. Q I hear from bankers that recommendations or guidance from Washington, D.C., are often implemented in examinations as requirements. With nearly 2,500 examiners across the country, how do you communicate your vision and priorities to the field? How can Washington better communicate to examiners what is required and what is suggested? A We work very hard at ensuring examiners understand the priorities and concerns of the agency nationally while tailoring specific supervisory strategies to the individual needs and risks of each institution. Our bank supervision policies and procedures establish a common framework and set of expectations for everyone, bankers and examiners. The OCC’s portfolio managers tailor the supervision of each community bank to the bank’s individual risk profile, business model, and management strategies. We give our assistant and associate deputy comptrollers considerable decision-making authority, and expect them to make most supervisory decisions locally. Good communication is key to everything we do. We regularly meet with bankers to understand the issues they face and we seek to ensure that we apply our supervisory policies, procedures, and expectations in a consistent and balanced manner. I encourage bankers to take advantage of the expertise assigned to their institutions and raise concerns with their assigned examiners and with the district management teams. Our ADCs and district deputy comptrollers expect and encourage such inquiries. If bankers need to, our ombudsman provides bankers with another venue outside their supervisory chain to discuss their concerns, informally or formally. The OCC’s ombudsman is fully independent and reports directly to me. 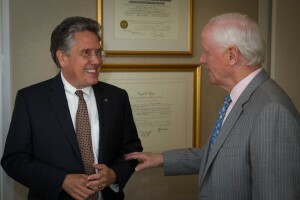 This office provides bankers with an impartial ear to hear complaints and a mechanism to facilitate the resolution of disputes as well as an appeals process. Q We have recently seen non-banking agencies without a deep understanding of the financial sector issuing rules that have significant effects on the banking business—consider, for example, the Department of Defense’s tighter limits on military lending and the Education Department’s rules that affect on-campus banking. How can the OCC work with non-banking agencies to help them better understand our industry before they undertake these rulemakings? A We actively seek opportunities to work with all agencies involved in rulemakings that affect products and services offered by national banks and federal savings associations. Whether through a consultation or through a more formal role, where law allows we will continue to provide comments and offer solutions that preserve the safety and soundness of the national banking system and ensure national banks and thrifts are able to offer the products and services their customers need. We are also working to strengthen our relationships with agencies charged with oversight of activities that intersect with the federal banking system. After all, we have more than 150 years of experience to share.